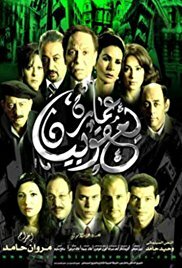 Based on the novel, The Yacoubian Building (2002) by Alaa Al Aswany. Release date: June 21, 2006. Budget: $3.5 Million. Considered to be the highest-budgeted film in the history of Egyptian cinema. The film debuted to box office returns of over LE 6,000,000 in its first week, giving it the record for the biggest debut ever for a theatrical film in Egypt. Cumulative profits of LE 20 million during its initial theatrical run, making it one of the most profitable films in Egyptian cinematic history. Woven through a series of interconnected plots situated around the Yacoubian Building; a run down apartment building set in the middle of Cairo, the film centres around the established power relations and hierarchies within the inhabitance of the city. Locating both the wealthy and the poor, The Youcabian Building becomes the locus of varying and intersecting struggles of power, from corruption to sexual harassment, to homosexuality, religion and drugs. The film portrays the rampant social inequalities and persistent strife to establish oneself in the Egyptian social. Daniels, Kate. “Film Review: The Yacoubian Building (2006).” Global Media and Communication, vol. 4, no. 1, 2008, pp. 107–111., doi:10.1177/1742766507086855.